Secretariat of the Convention on Biological Diversity, presumably a subsidiary of the UNEP, published their third outlook of global biodiversity. Although it is a 'biodiversity' outlook, energy issues are deeply intertwined with this ecology issue. In the report, a figure caught my attention. They nicely re-drew figures from a 2009 Science article (Its source is cited below.). 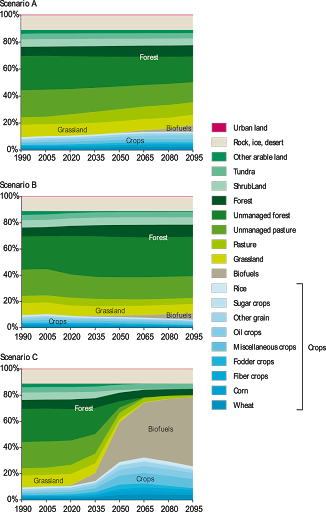 Three figures are global land use projections according to three scenarios A, B, and C.
Scenario A: a business as usual scenario. Scenario B: a scenario in which incentives, equivalent to a global carbon tax, are applied to all carbon dioxide emissions, including those resulting from land use change, to keep carbon dioxide concentrations below 450 parts per million. Scenario C: a scenario in which incentives, equivalent to a global carbon tax, are applied to carbon dioxide emissions from fossil fuels and industrial emissions only, with no consideration of emissions from land use change, to keep carbon dioxide concentrations below 450 parts per million. If there's no regulation on land use while greenhouse gas emissions from industries are restricted, most land areas which are covered with wild grasses, shrubs, trees will be converted to commercial cropland exclusively developed for biofuel production. This very possible scenario, if realized, will be a major attack on global biodiversity conservation. Nobody exactly knows how catastrophic the biodiversity decline will be. However, that uncertainty cannot exempt us from the duty to ensure that future generations have at least as same natural endowments as what we have now.